His autobiography, Born Standing Up, is insightful, articulate, and candid. There are many examples of famous Performer Artisans to point to, since they are the most visible personality type in our modern American society. Most Hollywood celebrities are Performer Artisans. However, most famous Performers are using other people’s material in their performance (whether it be in acting or music), so an insightful, articulate, and candid autobiography of the Performer Artisan is, in fact, very rare. Artisans, typically, are not particularly interested in the mulling over the past and subjecting themselves to deep introspection; they are for the here and now, or the opportunities for the future. Two other autobiographies, for example, that illustrate this point are Rickle’s Book, by Don Rickles, and Myself, by Bill Clinton. Rickles’ autobiography is short and candid (shadow written by his co-author) whereas Clinton’s is articulate and long. Both Rickles and Clinton put a gloss in their look back at themselves which is, of course, understandable because of their Temperament, but not particularly insightful. Stephen Glenn “Steve” Martin, Performer Artisan, (born August 14, 1945) is an American honorary Academy Award winning actor, comedian, musician, author, playwright and producer. Martin came to public notice as a writer for the Smothers Brothers Comedy Hour, and later became a frequent guest on The Tonight Show. In the 1970s, Martin performed his offbeat, absurdist comedy routines before packed houses on national tours. In 2004, Comedy Central ranked Martin at sixth place in a list of the 100 greatest stand-up comics. It was announced in September 2013 that the Board of Governors of the Academy of Motion Picture Arts and Sciences would award Martin an honorary Oscar at the Academy’s 5th Annual Governors Awards in November 2013. Comedy is a difficult performance art. Acting can be done by novices — some kids can pick it up naturally. Deliberate comedy — stand up — takes years of practice, with a lot of bone crushing discouragement along the way. As Martin discusses his life and his comedy, one gets some sense of what he went though: the ups and the downs. Although I have never thought much of Steve Martin as a comedian, for each person has his own sense of what is funny, many people love his comedy. On the other hand, I found his autobiography, as a Performer Artisan, quite intriguing. As he details growing up, he gives an insightful portrait of his family and describes how he viewed his comedy and its development. Moreover, it always seems that comedy comes from some degree of tragedy. This is well known about comedy. Martin gives us vivid sense of this with his description of his last day with his dying father, for he had not got along with his father practically all his life. 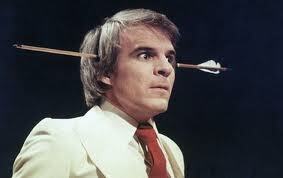 This misunderstanding of human temperament served as a powerful driving force in Steve Martin’s life. When a parent gives to their child, both laugh; when a child gives to their parent, both cry.